The One Direction “One The Road Again Tour 2015″ in Manila, Philippines announced that there will be one day extension. The popular British boy band are coming to the country for 2 nights concert. Originally, the One Direction's concert was set on March 21, 2015 at SM Mall of Asia Arena. And because there are so many Filipino fans who wants to watch the said concert. The productions officials decided to extend the concert for another 1 day. If you watch the news about the first selling day of tickets, thousands of One Direction Filipino fans and supporters flooded the venue just to buy their dream tickets for 1D’s Manila concert. 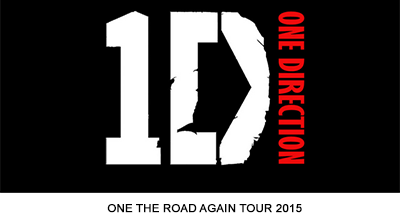 The “On The Road Again Tour 2015” on March 21-22, 2015 by One Direction are produced and presented by MMILIVE, Ovation Productions and Futuretainment. For more details, just call SM tickets at 470-2222 or visit www.smtickets.com. DISCLAIMER: The concert details given to this article is solely owned by the company mentioned. Any information given does not belong to the writer. Please do refer to the given link for more ads and infos. Comments or suggestions about "Extended! One Direction ″One The Road Again Tour 2015″ in Manila for One Day" is important to us, you may share it by using the comment box below.